Personal Finance 11 Edition The journey to financial freedom starts here! 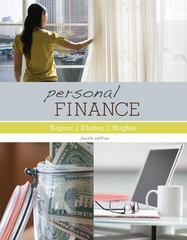 Kapoor/Dlabay/Hughes' market-leading Personal Finance provides practical guidance on how students can achieve peace of mind with regard to their financial situation. It provides many financial planning tools to help students identify and evaluate choices as well as understand the consequences of decisions in terms of opportunity costs. And now, McGraw-Hill's adaptive learning component, LearnSmart, provides assignable modules that help students master chapter core concepts and come to class more prepared. In addition, resources within Connect help students solve financial problems and apply what they've learned. Kapoor's practical resources, comprehensive coverage, and superior pedagogy combine with a complete digital solution to help students achieve higher outcomes in the course.Connect is the only integrated learning system that empowers students by continuously adapting to deliver precisely what they need, when they need it, and how they need it, so that your class time is more engaging and effective.